Searching for GarageBand ’09 topics this morning, I noticed a pattern — one that’s virtually impossible to notice given Google’s new self-appointed role of protector of digital humanity. 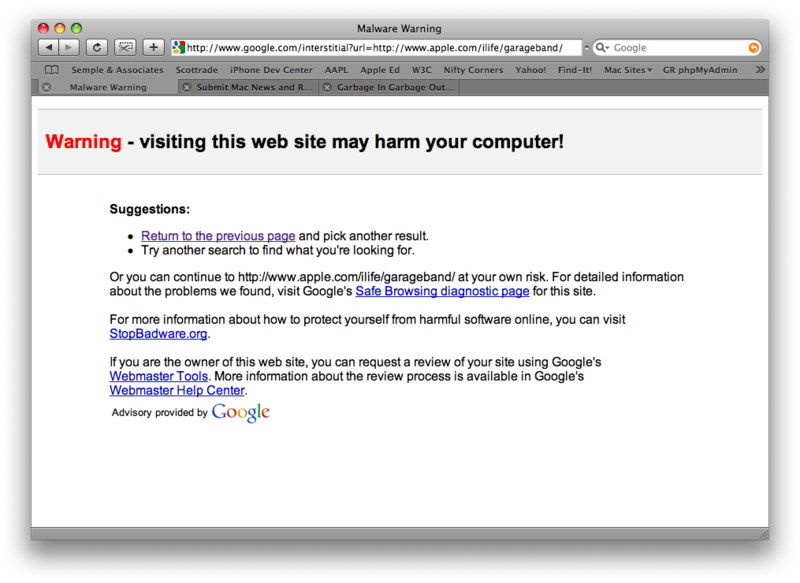 Every link is flagged as “This site may harm your computer” — even trusted pages on the topic, such as pages on Apple.com. Any attempt to visit the resulting links are intercepted by Google, in effect preventing me from visiting the site. Sounds like a good idea, except it isn’t, because Google can’t seem to get it right, and Google isn’t interested in fixing sites that are incorrectly flagged. 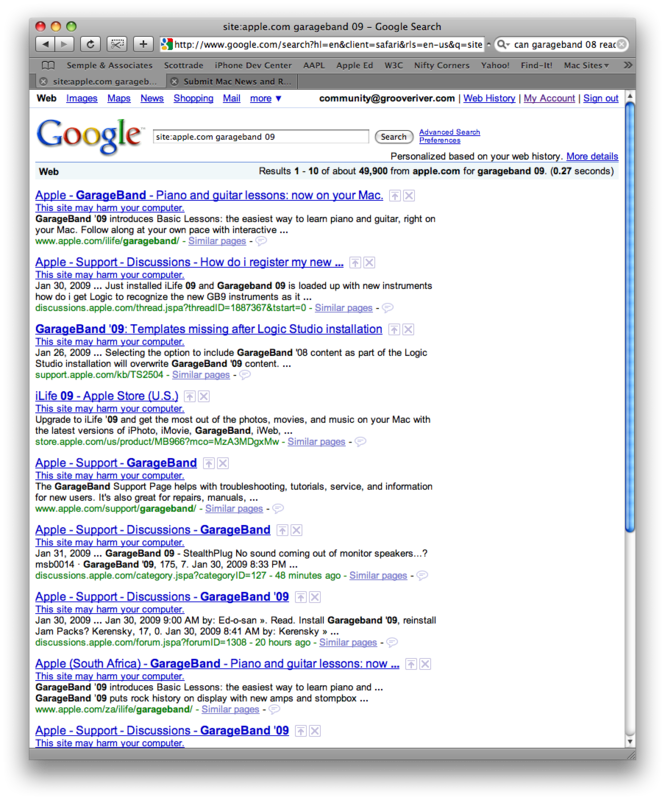 I searched using the term "site:apple.com garageband 09"
The impact of such as ruling by King Google is that those pages, linked from the search results, cannot be loaded into my browser. Having been flagged as "harmful", even might Apple Inc. can avoid the overarching reach of Google's misstep. A mistake on Google’s part? Probably, but as the owner of a site similarly flagged, I can testify that the behemoth that is Google rarely takes down such a notice. In my case, they caused a site of mine to lose nearly 90% of the traffic it was receiving after erroneously making the same determination. Now, I’m no fan of frivolous lawsuits, but I’m positive there are a number of businesses both large and small who are being irreparably harmed by Google’s service offering. Undoubtedly, Apple has the clout to rectify Google’s “mistake”. Sadly, the little man, like you and me, does not. Follow up: Google has officially posted a response, indicating that human error caused a 40 minute outage, whereby all search results were incorrectly marked as harmful. The overriding point, however, is that Google’s practice of editorializing in their search results can have massive consequences, even if well-intentioned. This entry was posted in Consumer Activism, Front Page, Technology and tagged Apple, Google, harmful, Internet by Chris Brewer. Bookmark the permalink. Google has responded that this was a human error, which effectively rendered Google Search useless for 40 minutes: Google’s official response.